Christmas Open House Weekend - Go Foxburg! The Red Brick Gallery announces its final exhibition of the year, an expanded show featuring new work by the members of the artists’ cooperative. The co-op consists of 15 artists from Clarion, Butler, Venango, and Armstrong counties. Many kinds of media and artistic approaches are represented within the group. 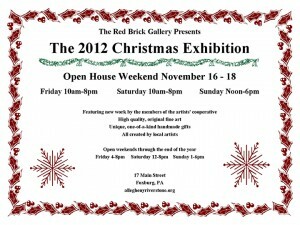 Located in Foxburg, PA, on the Allegheny River, the Red Brick is a beautiful exhibition space housed in a two-story historical building. Both the setting and the character of its original architecture contribute to the charm and appeal of the gallery. The gallery will have extended hours on opening weekend, and the public is invited to attend. Come by and enjoy refreshments while taking in the exhibition and meeting some of the artists. There will be a door prize awarded to one of our guests. All types of drawing and painting, fiber art, ceramics, photography, and jewelry, created by some of the region’s most proficient artists, will be on display. 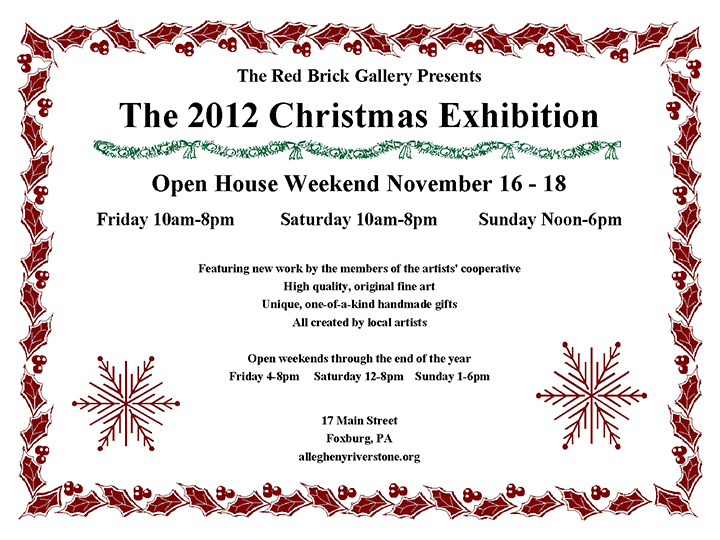 This is a great opportunity to view one-of-a-kind original fine art from many different local artisans. The holiday season is a wonderful time to visit picturesque Foxburg. Stop by the gallery after dining at Foxburg Pizza shop or The Allegheny Grille or shopping at the winery or the chocolate shop.